There are two categories criminal justice careers fall under. One is law enforcement; the other is legal. 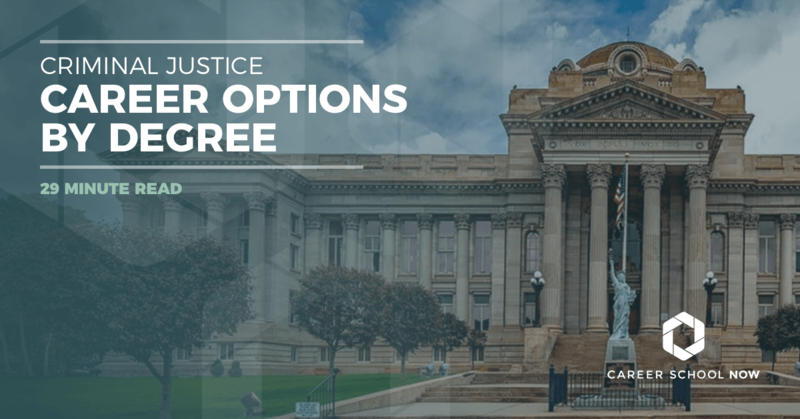 The legal side of criminal justice concentrates on careers that provide some sort of legal representation to individuals or businesses who have need for it. Lawyers, paralegals, judges, and court reporters are all are considered to be legal careers under the criminal justice heading. There are over 3 million people employed within the criminal justice sector, with many of them finding employment on the local, state, or federal level. Laws are created and put in place to keep some semblance of order and safety within communities. Criminal justice careers are a perfect way for you to make positive changes in the world, and there are many different law enforcement roles to go into. Careers such as police officer, accident investigator, private investigator, and U.S. border agents are just a few of the different fields you can enter within the law enforcement side of criminal justice. Getting a criminal justice degree, whether it’s a certificate, associate, or bachelor’s degree, will launch a career full of purpose and with room for growth. Learn more about this career field with our criminal justice practice test. Criminal justice certificates are available at many local schools, and there are accredited online programs too. These programs touch on the basics of the field and are generally used as a stepping stone. They let you start a career, then later you can further your education. On average, 30 credits are needed for a certificate, so it only takes a little longer than a year to complete if you attend school full time. Jobs that will be available to you are very entry level, so if you are determined to get ahead quickly in your career, then consider getting a bachelor’s degree from the outset or an associate degree at minimum. Still, certificates are a viable way to get your foot in the door. Bounty Hunter: Bounty hunting has become somewhat glamorized by drama TV. Off screen, it’s a tough field that can be dangerous and exhausting. You need a high school diploma or GED, along with completion of a training program through a private program or a community college. Some states have a licensing requirement for bounty hunters, while others will only fingerprint you and do a background check. You’ll find work through a bail bondsmen and track down fugitives for a percentage of their bond as your payment. The average salary of a bounty hunter is just over $45K. Corrections/Detention Officer:Depending on where you work, you may be fine getting a job with only your high school diploma or GED—and if you have military experience, even better. Some districts may require you to have two years of experience and several college courses under your belt. Agencies require you to be between 18-21 with no felony convictions, and you must be a permanent resident of the U.S. You will have to complete training through the academy. If you want to eventually work on the Federal level, then you’ll need to get a bachelor’s degree combined with 1-3 years of experience. The median annual salary for corrections officers is over $43K. Court Clerk: For an entry level court clerk position, you typically just need a high school diploma or GED—some court systems do require a two-year degree, however. Court clerks complete administrative duties, such as helping file legal complaints or collecting court fees. Job duties will depend on the court you work for and the amount of experience you already have. The more experience you have, the more upward mobility you’ll see. Your salary will depend on factors such as jurisdiction, court, and your position. The median salary is more than $39K, but without a college degree, your pay won’t be as high. Loss Prevention Specialist: This career is considered an entry level position, and the only educational requirements associated with it are a high school diploma or GED. However, it’s becoming a competitive field, so to have an edge over other applicants, you may want to consider getting yourself an associate degree, minimally. Otherwise, all you need to do is apply, interview, receive a background check, and get hired. Training is usually done onsite. Essentially, you’ll be in charge of preventing theft within retail stores, whether it’s by customers or employees. Salary is based on your employer, but expect between $12-$17 per hour. Notary Public: Usually appointed by the Secretary of State, a notary public is an impartial witness, screening the signing of relevant documents in hopes of preventing fraud from occurring. Each state has its own process for becoming a notary public. It’s important to check with your Secretary of State to find out what’s involved. In most instances, you must be 18 years old, be a legal resident of the state for which you’re applying as a notary, and have a clean record. There is a 3-6 hour training course offered by most states. You can get more information through your local Secretary of State or through an approved third-party program. Many notary publics work in law offices, mortgage companies, banks, and printing and shipping businesses. There is not an exact salary associated with notary public positions; this job is usually an addition to a regular position. Police Dispatcher: Like most other positions in criminal justice, you’ll first need a high school diploma or GED, and you should have decent typing skills. You need to be aged 18 at minimum to work as a police dispatcher. You also can’t have any felonies on your record. As as police dispatcher, you take emergency calls, help the callers, and send out emergency vehicles. You’ll receive on-the-job training, so no postsecondary education is required. However, most states will require you to become Emergency Medical Dispatcher certified, along with some continuing education every couple of years. The median annual salary for a police dispatcher is over $39K, topping out at more than $62K. Police Officer: Unless your plan is to work for the Federal government, which takes a bachelor’s degree, you can enter police academy with a high school diploma or GED. You’ll have to pass certain physical and emotional standards, have no felonies, and not have a drug addiction. Once you’ve established yourself in the police force, you can expect to make an average of $62K annually. However, factors like location, department, and experience can impact your pay significantly. Security Guard: Malls, banks, apartment buildings, and other establishments ensure the safety of the people by hiring security guards. They make sure there are no illegal actions taking place on the premise they are hired to watch over. You’ll find security guards positioned behind a front-entry desk or patrolling around the area, keeping an eye on things. Another type of security guard would be a gaming officer. Gaming officers are hired to protect casinos. They use audio-visual equipment to monitor gaming tables and machines for any illicit activity. The place of employment will determine the exact job duties of a security guard or gaming guard. If you’re considering a job as a security or gaming guard, you must be at least 18 years of age and have a high school diploma or GED. All 50 states require any type of security guard to have a license to carry a gun. Gaming officers do need to have knowledge on how to work the electronic equipment used at casinos. There will be random drug tests given and a detailed background check. There is not a formal education requirement for security guards. Most employers provide on-the-job training for their new-hires. Many states require a certain amount of training hours, along with additional annual training sessions. Armed guards can expect more rigid training than most other types of security guards, due to the weaponry they use on the job. Most states require that all security guards be licensed. Security guards’ median annual salary was $26K. Gaming officers earn, on average, $33K. The more experience you have, the higher your pay will be. A background in law enforcement will give you an edge in the hiring process. Transit and Railroad Police: As a specialized police officer, you will be hired by transit companies such as railroads and buses. You will investigate crimes committed toward or by passengers such as drugs, fraud, assault, and robbery. You will either work directly for the transit company or a specialized unit in the police force. To begin your training as a transit police officer, you must have your high school diploma or GED, and be at least 18 years old. The local transit authority is who the training is carried out through. Educational training requirements vary, some areas expect 1,000 hours while others only require 100 hours. There will be physical and psychological exams given to those entering careers as transit police officers. The Bureau of Labor Statistics states the average annual salary of a transit police officer is $70K. The job outlook is similar to most other law enforcement careers, which is a tiny bit above average at 7 percent. Transportation Security Officer: You’ll be working at an airport, following the Department of Homeland Security policies and procedures. With just a high school diploma or GED and a clear background check, you can start an entry level position. You need to pass the training program and become certified, which is renewed annually through continuing education and training. There is upward mobility within the TSA once you start gaining experience. Entry level positions earn more than $40K annually. Get some of your criminal justice career questions answered. If you go to school full time and stick it out to the end, you can get an associate degree in two years and there are online programs too. You’ll take introductory criminal law classes, along with the core curriculum of math, science, language arts, social studies, and your electives. Criminal justice classes you’ll take are forensic sciences, terrorism and intelligence, behavioral sciences, management, and more depending on your school and its program. To complete your associate degree, you will need between 60-65 completed credits, which translates to 15 credits per semester. Don’t worry; it’s not that overwhelming! Once you get that degree, you’ll be able to find an entry level job—or maybe even a bit higher. With an associate degree, your credits will transfer if you decide to continue on to get your bachelor’s and then master’s. If you’re feeling ambitious, there are even doctoral degrees in criminal justice! Accident Investigator: You recreate an accident to determine who or what caused it. Taking pictures, examining evidence, and talking with witnesses and survivors will help you put together a more vivid picture of what transpired. Degrees aren’t a necessity; however, to gain a competitive edge, it’s a good idea to get an associate degree. You can specialize in aviation, automobile, and marine. Pay averages around $64.9K, and the more specialized you are, the higher your paychecks will be. Animal Control Officer: Animal control officers are at the front line of animal safety, in charge of protecting their rights. Without a doubt, these everyday heroes have giant hearts. Animal control officers are hired by either the city or county and act to protect communities for both the animal and their humans. To become an animal control officer, you must be a minimum of 18 years old and a high school graduate or GED holder. Many employers will give potential hires a drug screening and a background check. It is also recommended that you have some experience in working with animals. If you need to gain that experience, try volunteering at an animal shelter, veterinary hospital, or humane society. The agency you want to work for will determine your educational path. Having an associate or bachelor’s degree in animal science, animal management, or related fields is highly recommended for those looking to become animal control officers. Many states, as well as employers, will require their new hires to have a certification. Two industries that offer these certifications for animal control officers are National Animal Care & Control Association and the American Society for Prevention of Cruelty to Animals. You’ll need to pass with a B or better, and expect to take continuing education courses in order to maintain your certification. The job outlook for animal control officers, according to the Bureau of Labor Statistics website, is 20 percent growth through 2026. The median annual salary for animal control officers is $37K. Bailiffs: Bailiffs ensure courtroom security for everyone inside it, announce the coming and going of the judge, and may also be the one who takes the witness and presents the oath. Bailiffs are sometimes called upon for administrative duties, such as stocking supplies, delivering documents, and taking offenders into custody. There are times when a sheriff might not be present in the courtroom, which means the bailiff will step in to fulfill sheriff duties, as well. Bailiffs must be at least 21 years old and have a high school diploma or GED, be in excellent physical condition, have outstanding conflict management skills, and enjoy being a team player. If you’re going to work on the federal level, bailiffs should have a bachelor’s degree in a field related to criminal justice. State and local level varies depending on jurisdiction. Community college or trade school criminal justice degrees or diplomas are preferred when employers are looking to hire bailiffs. Once hired, they undergo a more formal training period regulated by their state or federal government. Military experience counts toward on-the-job experience. The average annual salary for bailiffs was $42.9K along with a pretty decent retirement package. A 7 percent decline in employment growth is expected for bailiffs through 2026. But, there are always those who are retiring or switching positions, leaving job openings. While there isn’t a revolving door, there are always spots needing to be filled. Blood Splatter Analyst: One big clue left in a crime scene can be blood and the pattern it’s in. A blood splatter analyst is properly trained to read the clues and translate them into evidence. You’ll need to have a very in-depth understanding of blood and human properties, along with meticulous math and science skills. Some jurisdictions prefer bachelor-degreed prospects. However, an associate degree in biology, anatomy, or statistical analysis along with job-related experience could get you into the position. The average annual salary is more than $57K. Court Reporter: To work as a court reporter, you need a certificate or an associate degree. You’ll learn to use a stenograph machine to take court notes, testimonies, depositions, meetings, and other types of live proceedings. Once you graduate high school or received your GED, you can get your associate degree, which takes around 33 months in this case. You’ll be trained to type the necessary 225 words per minute, one of the reasons the program lasts close to three years instead of the typical two for an associate degree. Some states will have you become a notary, while others will expect a license. There are two different certifications available to you as a court reporter, they are through the United States Court Reporters Association, and the National Court Reporters Association. The median annual salary is $55K. Detective and Criminal Investigator: Have you always wanted to work with law enforcement agencies, corporations, or lawyers by gathering facts and collecting evidence to help solve a variety of different crimes? As a detective, you will interview witnesses and suspects, examine the records associated with the case, do suspect surveillance, and help with the arrests. You can choose to specialize in areas such as crime or homicide. To be considered as a candidate for a detective position, there are a few prerequisites. You need a high school diploma or GED, and have to be at least 21 to even be considered for the role of detective. There are two degree paths for law enforcement: an associate degree or a bachelor’s degree, both where you’ll focus on subjects such as criminal law and other fields related to law enforcement. It is also recommended that detectives take a foreign language, particularly if you’ll be working in urban environments. Most detectives begin their careers as police officers, so you’ll go through the police academy once your college education is complete. Then, you’ll probably want to work on the force, because most detectives are promoted from within the department. As a detective, you’ll earn an average annual salary of $62K. The more experienced detectives who have put in a lot of time will bring home over $100,000 a year. Fish and Game Warden: Enforce hunting, fishing, boating, and trapping laws as a fish and game warden. You are the protector of all wildlife, including the humans, in your jurisdiction. Since you’ll be spending your days outdoors, there are fitness requirements you have to meet, and you will need an associate degree in biology, ecology, wildlife management, and other such fields. You’ll need to complete 60 credits, which should only take two years if you go to school full time. Depending on where you work, you may have to complete two years as a police officer before being eligible to be a fish and game warden. Once hired, you will be required to take a training program lasting 3-12 months. The average annual salary is a bit over $56K, but realistically, yours may be different—it depends on experience, department, and location. Forensic Nurse: You may work at a hospital as an RN, but you’re always on call with the police department—your job goes above the typical job description of an RN. You will be on the front lines when it comes to examining victims of various crimes such as sexual assault, abuse, and other forms of physical aggressions. There are subspecialties for you to consider, which are medical-legal counseling, death investigations, and forensic psychiatric nursing. You can start out with your associate degree as a registered nurse. However, you’ll need to continue on through your master’s degree in forensic nursing, pass the NCLEX exam, and become a registered nurse within your state. From there, you’ll need to become certified in your specialty. For example, become a Sexual Assault Nurse Examiner (SANE); you can get the certification through the International Association of Forensic Nurses. Once you’ve done that, you can find a job and begin your work. Your salary will average $70K annually. K9 Officer: Canine officers have the same duties and responsibilities as the police do. However, their partners are covered in fur and walk on four legs. The canine partner of the K9 officer has been highly trained in multiple skills, such as sniffing out drugs, search and rescue, locating corpses, or finding bombs. It’s your dog’s skills that will determine your specialty area. A main part of the canine officer’s training will revolve around learning your partner dog’s abilities, to create a seamless team package. Since the dog will most likely be living in your home, you’ll need to be best buds with him or her. Most potential employers expect K9 officers to have an associate or bachelor's degree, while many even prefer a master’s degree in criminal justice. There is also the 2-4 years you’ll need to put in on the police force before you’re eligible to transfer to the K9 unit. You will still need to go through formal police training, where you'll learn the rules and regulations, laws on both the state and federal level, how to handle firearms, investigative techniques, among other subjects necessary to the education process. And once you’ve been chosen, there is a specialized training program for canine officers. Canine officers are a specialized team of elite police, and there isn’t a good way to determine the job outlook, because they make up such a small portion of most police forces. The salaries of canine officers usually reflect the amount of time and experience they have. Average pay is closest in similarity to that of other police officers and detectives, which is more than $60,000 per year. But, with K9 officers, other determining factors such as location, police force size, and job experience will also weigh into their pay. Paralegal: Paralegals provide support to their lawyer employers. You’ll need an associate degree in paralegal studies. Some lawyers prefer their paralegals to have a bachelor’s degree, though. And even still, there are some employers who will provide on-the-job training if you have your degree in something other than paralegal studies but show an aptitude for the field. Paralegals can do pretty much everything a lawyer does except stand before the judge and jury. Paralegals earn over $50K on average, and you can earn more if you specialize. Private Investigator: While it may be a good idea to get at least an associate degree in criminal justice, there are no exact education requirements to become a private investigator. Having formal experience in the field would definitely be a plus, though. Most states do require private investigators to have a license to practice, as well as a license for concealed weapons. Much of the training is through on-the-job experience, so consider working with someone who will teach you the ropes. The average annual salary earned for all that undercover work, locating missing people, and being a super sleuth crime solver is $50K. U.S. Border Patrol Agent: You’ll be the first line of defense in keeping our borders safe. You’ll keep out immigrants entering without legal permission, potential terrorists, and other dangers threatening the security of our country. You have to be a U.S. citizen with a valid driver’s license, have no felonies on your record, be drug-free, meet certain medical requirements, and pass a Border Patrol Entrance exam with a score of at least 70 percent. You must have one of the following: valid work experience, a bachelor’s degree plus one year of experience, or completed one year in graduate school. There will be an extensive training program, first in your state, and then an additional 19 weeks at a base in Georgia where you learn anti-terrorism techniques and how to handle firearms. You may also need an Spanish immersion program depending on which port you’ll be based. Your pay is established using the General Schedule (GS) payscale. G5 starts at $32K and G7 at $40K. In bachelor degree programs, you’ll dive deeper into the criminal justice topics. You’ll spend a minimum of four years in school completing an average of 125 credit hours, but you’ll be qualified for a greater amount of jobs in the industry. With the amount of competition happening in the fields of criminal justice, jobs that once took experience or an associate degree now ask for a bachelor’s or master’s degree. However, field experience may help offset the amount of education necessary. And with a bachelor’s degree, you’re earning approximately 30 percent more per week than those with associate degrees. CIA Agent: The CIA, or Central Intelligence Agency, reports to the executive and legislative branches of government. There is much that is top secret, like its budget. But it’s not a secret how to work for this network of agents. There are four different teams: the Clandestine Service that goes undercover all over the world and collects information pertaining to whatever mission it is on; Directorate of Science and Technology, which collects information found on television, radio, print, and the Internet; Directorate of Analysis, where all the information from the first two teams goes to be interpreted and written up in a report; and the Directorate of Support, which provides support to the entire organization. To even be considered for the CIA, you must be a U.S. citizen and be subjected to a very intense background check. There are a battery of tests—polygraphs, medical, and psychological—that you’ll go through. To be a professional trainee, you need to have a bachelor’s degree and a 3.0 GPA. If you’re considering the CIA, there are many acceptable college majors such as criminal justice, homeland security, international relations, engineering, economics, and some sciences. Salary for a CIA agent averages more than $80K but can go well into $100K. Computer Forensic Investigator: Fighting cybercrime in the name of law enforcement is one of your most powerful superpowers. You’ll need a bachelor’s degree in computer forensics, and consider a master’s degree to give you that extra competitive edge. Each state has different licensing requirements, so make sure to look into what your state expectations are. There are quite a few different types of certifications available to you. EnCase Certified Examiner and Certified Computer Forensics Examiner are two of them. Then, all that’s left is to find a job, interview, take all the background checks, drug tests, and any other examinations the job requires. You’ll earn a median salary of $68K. Read about all types of cyber security careers. Crime Scene Investigator: You’ve watched every season of CSI and every spin off. You’ve decided to commit your life to becoming a crime scene investigator, like your favorite characters on television. Life is very similar to how the career is portrayed on the small screen, minus the dramatic sound effects. You’ll identify and organize the scene, document the physical evidence, and then collect it to be analyzed and preserved. You’ll need to get a bachelor’s degree, but if you want more career advancement opportunities you’ll need a master’s degree as well. Completing police academy isn’t a must, but it’s easier to start your career with that experience under your belt. There will be a period of on-the-job training where you’ll gain experience under a mentor. As for certifications, each state has its own requirements, so find out what yours are. Some continuing education is also part of the job. You’ll earn, on average, more than $57K. Deputy Sheriff: The main difference between a sheriff and a deputy sheriff is that a sheriff is an elected position. While many states don’t have formal education requirements outside of a high school diploma or GED, they look more favorably on potential deputy sheriffs who have an associate or bachelor’s in criminal justice fields. There will be a civil service exam necessary to pass before gaining admittance to the deputy sheriff training program.To actually become a deputy sheriff, once all the training and education has been completed, there will be a background check, drug screening, and a physical test. The background check will show if you have any felony convictions you haven’t shared, and the physical test will make sure you’re in good enough condition to act as a deputy sheriff. Your main purpose will be to enforce law and order as you fight to prevent all types of criminal activity in your county. Like a police officer, the deputy sheriff patrols assigned areas, investigates complaints and potential crimes, makes arrests, interviews all involved with a case, and testifies in court. Deputy sheriffs are usually hired by the county the work for. The average salary is $61K for a deputy sheriff. In law enforcement agencies, there are constant retirements creating job openings so, while employment growth is slow, there will still be positions opening. FBI Special Agent: You’ll need to get a bachelor’s degree, or even a master’s, if you want to be an FBI special agent. There are five entry programs for the FBI: Computer Science, Accounting, Languages, Law, and Diversified. Tailor your education to fit the program you’re interested in. You’ll need to complete an internship, and then think about getting a master’s degree to make yourself more marketable. It’s a competitive field, so the more degrees you have, the better. To be qualified to apply to the FBI, you have to work three years in your chosen field before you can complete the application process. You can expect a rather intrusive background check where they look into your family and the people you hang around, so this process can take a few months. You’ll have a physical exam next, with a physical fitness assessment test after. If you pass with flying colors, you head off to the FBI training academy followed by a two-year probationary period under a special agent mentor. Continuing education is required; it also will help you move up the payscale. The average salary is more than $63K, but the top pay runs more than $160K. Also, expect bonuses. Forensic Serologist: Forensic serologists help in investigations by analyzing body fluids found at the scene of death. Through forensic serologists, causes of death are more easily determined. To work as one, you’ll need a bachelor’s degree in biology as well as take some math and criminal investigation classes. Consider an internship. It’s not a requirement, but it’s recommended for experience sake. You’ll make an average of $56K annually. Mediators: Hired as an impartial third party, mediators help settle disputes by guiding the conflicting parties into a productive resolution-focused discussion. Aside from the standard skills of listening, reading, and writing, a mediator must have strong decision-making skills to adequately weigh facts and apply them resolving to the conflict. Mediators are usually retired judges, attorneys and their education most likely included courses in conflict resolution. There are no degrees that are specific to mediating however there is a 20-40 hour training course that most states require mediators to complete. Program courses will include topics such as listening skills, conflict management, and interpreting body language. Full requirements vary by state so check with yours to know completely what path to take. The median pay for mediators was $60K. The job outlook for mediators through 2026 is projected to grow 11 percent, which is much faster than average. Those who have a background in law, such as lawyers or judges, will find it easier to obtain mediator positions. Parole Officer: Your job will be to keep those who have served time from serving time again. You may have 100 people on your docket, all needing a variety of attention. You’ll help them reintegrate into society and assist in finding them rehab, jobs services, and education. You will have to attend their hearings and report their cases in front of a parole board. To start your parole officer career, you need a bachelor’s degree in psychology, sociology, or criminal justice. A master’s degree is something to consider; in some jurisdictions, it’s a requirement. You must be at 21 years old with a valid driver’s license to apply for a position. There are training sessions and certification programs you’ll need as well. Expect a background check, a psych evaluation, and a drug test before being hired. Your average salary will hover just over the $49K mark. Probation Officer: Instead of being sent to jail, some offenders are given probation. It’s your job as a probation officer to offer social services to help rehabilitate a person in custody. During your frequent appointments together, you judge whether the person is a risk to the community. You also help determine the best course of action for the offender’s rehab. To enter this career, you must have a bachelor’s degree in social work, behavioral science, or criminal justice. You’ll have to pass competency exams, a background and drug test, and be at least 21 years old. There is a mandatory training program, and you’ll have to work as a trainee for at least one year before going off on your own. If you have a master’s degree, you’ll find there’s more job growth potential. Median annual salary is $50K. Sheriff: As a sheriff, you’re responsible for your county’s law enforcement. As the sheriff, you will work alongside other law enforcement officials to uphold the laws of the land. Sheriffs may catch and arrest suspects, give citations, deliver warrants, patrol areas, and appear in court. Other job duties of a sheriff could include confiscating property, manage emergency situations, and question witnesses. Sheriffs, along with police officers, put themselves in the line of fire on a daily basis so the job comes with hazards. The job of sheriff is similar to that of a police chief. You don’t just become a sheriff, you have to be voted in. However, there are things you have to do in order to even be eligible to run as a sheriff. First of all, you have to start out as a police officer. You’ll also need a bachelor’s degree from a criminal justice or law enforcement program. Depending on which jurisdiction, you’ll have to work 1-5 years as a police officer. Once you’ve filled the requirements, you can file the necessary paperwork and run for your county sheriff. If you’re lucky enough to be elected, you’ll have to swear in an oath, and agree to a contractual bond. The average salary of a sheriff is $101,772. The average salary range is between $96,098-$107,951. Of course, salaries are dependent on the state or jurisdiction of the sheriff. ARE ONLINE CRIMINAL JUSTICE DEGREES A GOOD IDEA? Taking classes online is a great way to get your degree, especially if you have other things going on in your life that directly impact being able to go to a physical school. However, there are some things to be aware of when considering online school for your criminal justice education. For example: If it’s too good to be true, then run far away. Also, if the school doesn’t have the proper accreditations, then don’t apply. You need to get your college credits from an accredited school, otherwise your degree may not allow you to sit for necessary certification exams. The average rate for online school ranges between $100-$500 per credit hour. One four-hour class will cost you anywhere between $400-$2,000. Financial aid may be available, even for online college. You need to check with the college admissions counselor or the school’s financial aid advisor. Similar to physical schools, you will be able to get an associate, bachelor’s, and master’s degree, depending on the school and what options it has to offer.